Past Illustrious Master Apron, Los Angeles Fraternal Supply Company Inc. 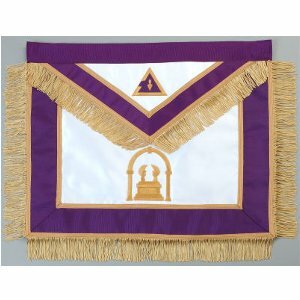 This Past Illustrious Master Apron is hand embroidered using cotton embroidery thread and has Purple Grosgrain Ribbon border with Gold Braid on the inside and outside edges and is finished with 2-Inch Gold Silk/Rayon fringe. The apron has an adjustable web belt with a " T " hook closure, perfect for a waist line of up to 50 inches. This apron measures approximately 14" x 16" and has a blue satin lining with a pocket on the back.